artist in the family now, huh? party. What would they say?" 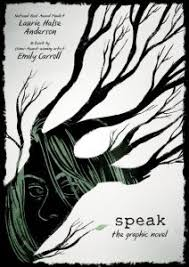 If you read Speak (Farrar Straus Giroux, 1999), you will know how heartbreaking Melinda's story is. This graphic novel, created for a new audience, brings the repercussions of her attendance at a summer's end party to the forefront. She has not even started high school, and already she is targeted as the girl who called the police and brought an end to that party. No one knows what happened that night, and Melinda can't tell them. As she struggles, she becomes withdrawn and less willing to speak at all. She skips school, does not complete assignments, and becomes more and more depressed. Only her art teacher is able to reach out her, helping her to express her thoughts and feelings through her love of art. The combination of images and words bring new attention to Melinda's inability to face the demons that plague her, to battle the lies and verbal attacks of her schoolmates, to begin to find her voice again, and to finally speak her truth about what happened to her at the party. Using a limited gray/black palette Emily Carroll undoubtedly shows the depth of Melinda's depression. The characters are real and expressive, the dialogue clearly represents the original story, and every emotion that Melinda feels is felt by the reader. This harrowing story of sexual assault and its lasting consequences is handled with empathy and even wit, at times. The first person narration is painful, unmistakable, and effective. The transformation of a compelling book I read so long ago keeps the story current and allows new readers a powerful look inside Melinda's life as she begins to come to terms with her day-to-day reality. "And so, she dialed the doctor. The woman had crisp, concise answers to Gilda's queries. There was no wheeze or other detectable frailty, and no ready distractions. There were, however, an array of available dates on which she could accommodate a home visit. Gilda made the appointment and set the telephone down. Sheila had starred the doctor's profile before she left ... "
The characters- Marin Greene, Summer Greene, Dr. Lucy Chang, Gilda, Owl, the Tectonic Plates. The setting is San Francisco and its surrounding sea and high cliffs, where those shifting tectonic plates are threatening an earthquake. Other objects of importance are three pennies, a ceramic piggy bank with a nickel in it, and a book, the I Ching. Beautifully connected in short, character driven chapters. this is an exquisitely told story. Readers will make an immediate connection with Marin, a foster child who has learned in the seven years she has been moved from one family to another that she may never be adopted. The truth is that she doesn't really want to be. She is sure that Summer will come back for her, and it all has to do with the I Ching her mother left with Marin when she abandoned her. Marin was four then; now, she is eleven. Her social worker, Gilda, is a rule follower and is trying to make arrangements for Marin to be adopted by Dr. Lucy Chang. There are some concerns. But, Gilda is willing to take the time to make it work. Marin, on the other hand, sees that her chance of ever seeing her mother again will become less likely if she is legally adopted. So, she sets off to find Summer herself. It takes some detective work, but finally she knows where to look. Once reunited, she is heartbroken to learn her mother has no interest in being a mother, and doesn't want to have anything to do with Marin. Will Lucy be allowed to adopt Marin? There is so much tension in their story, with an earthquake looming and Marin's reticence to let herself get close to anyone for fear of being rejected once again. Owl watches over the 'hatchling' hoping to see their issues resolved. The attention shifts from one character to another quickly. Each is part of the concern that surrounds Marin, and wants to make her life better. There is a real sense of family, support and hope. Marin is strong, resourceful and very courageous as she does her best to find her way to happiness. "I wanted to flip my lid and rip up my paper. Throwing the ball was a much better choice than that. Couldn't she see how grown-up and responsible I was being? Before I could explain, she asked again, "Can I trust you with the ball?" She put it back on my desk and I grabbed it, but it didn't feel as good anymore." Lauren, like all children, has good days and bad ones. Unlike most children, Lauren is on the autism spectrum and some days she feels like a slug. Now, slugs leave beautiful trails as they go but we do know that those trails are slimy, and that slugs move very slowly. Lauren likes to be prepared for the events of her days. Any inevitable change can cause anxiety and a reaction. Many things prove upsetting - missing a favorite activity, sitting on a new seat on the bus, not getting her shoes tied right, and even writing new alphabet letters. All these things are pretty common in the life of a child going to school. Using Lauren's voice to tell her story gives it an immediacy and honesty that make it easier for readers to feel the frustrations she sees in her world. Those slug days are hampered by outbursts, confusion, and a lack of patience all around. Lauren also experiences butterfly days when many things go right - her teachers, the kids at school, and her family enjoy her humor, her growing ability to communicate and find joy in some activities. She loves a trip to get ice cream, and to work on personal projects. With support from others and her own stubborn determination to voice her feelings, she is making progress. Lauren's growing perception of herself and her attempts to remain calm and try to understand others are clearly evident when she befriends another student. She does her best to help Irma deal with her own insecurities about the changes wrought with attendance at a new school. 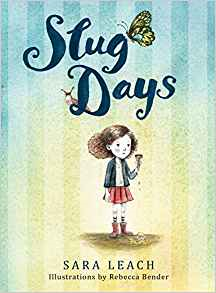 This perceptive and sensitive tale chronicles a week in the life of a young, determined girl who thinks differently than many others. She is learning and we are learning with her. "More than ever, soccer gives hope to the young who train intensively with the dream of being noticed by a club. It's also a cheap distraction. The Santos fill stadiums for very match. For many observers, it's the best club in the world! At the beginning of the sixties, the Brazilian club's popularity goes far beyond the country's borders. The team travels the world like music stars." With World Cup Soccer set to begin in Russia in three weeks, the world's sports enthusiasts will be glued to the television and listening to stories of players, teams, other World Cup championships. Surely, we will hear stories of Pele, who is considered one of the greatest athletes in sports history; at least among those whose greatness is long past. This graphic novel that follows him from his early days through his storied career will surely be welcome in classrooms and families where soccer is highly regarded. He grew up poor in Brazil and found his way to the pros at 15, playing in his first World Cup at 17. He dominated the sport for 20 years, scoring 1,284 goals and playing in 3 World Cups. What a career! This is strong biography that does not stick to Pele's playing career. It allows readers a look at many aspects of his life - how fame changed him, his separation from his family at such a young age, his limited education, and how time given to travel and training took precedence over all else. There was much he could not control, politically and in terms of the game itself. It made for many complications in his life. He loved to play soccer with children, and would seek them out wherever he was. He needed the distraction from many of the other difficulties in his life. Always the big smile for his fans. he was appreciative of the talent he had and was willing to teach new skills. But, he was also determined to make a statement about the politics that plagued his country. There were problems along the way; they are presented in clear text and accompanied by fascinating artwork. All in all, this novel presents a well-rounded account of Pele's career, the mistakes he made, the goodness that he shared with the worldwide soccer community. "Now it was just the two of us, and I walked Abuela to her apartment. The first thing she did when she got inside was head to her little kitchen to make a batido from fresh mangos that had fallen from the neighbor's tree. Every summer when the mango trees started giving fruit, the couple who lived in the building next to ours would give her a grocery bag full of ripe, delicious mangos." Grandmothers, as matriarchs in the family, are worthy of much respect. Such is the case in the Zamora family. Abuela and Abuleo worked hard, after arriving in Florida from Cuba, to make a living and a life for their family. Today the family restaurant, La Cochina de la Isla, is the heart of that family's life. 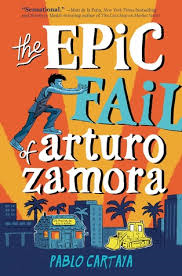 In this novel about the Zamora family, their community, and the many friendships they enjoy, the narrator, Arturo, helps us understand and learn everything we need to know about the love and warmth that the family shares and inspires. He is 13, already working in the restaurant that his mother is now running and still watching his beloved Abuela work her magic on the many customers who come to dine. When family friends Carmen and her father arrive from Spain for a visit, Arturo feels the stirrings of first love. His life becomes a trifle complicated as yet another issue arises when a land developer shows interest in the land where the restaurant and Arturo family apartment complex stand. The family had been hoping to expand their business into a piece of land beside the restaurant. Will those plans have to change? Will the family lose their livelihood - the restaurant that is an important part of this cultural community? Arturo's voice is sincere, strong, and funny. The author uses variety in the storytelling, with tweets, letters, the poetry of Jose Marti, and dialogue that switches between English and Spanish. 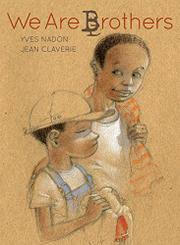 Secondary characters add depth, support and voice to this memorable family story. Inspiring and highly entertaining, it leaves me looking forward to meeting Arturo at some future date. 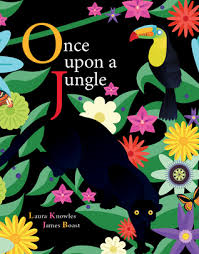 If you have plans for a jungle journey, you would do well to have a look at the beauty of your destination in this spectacular book. If not, you would do well to use it as a learning guide to the food chain that exists in such an ecosystem. The depth of color, the information provided and the cumulative nature of the telling are equal parts of this engaging picture book. A food web is dependent on all of its parts working together. This one begins with a diligent group of ants, together hauling an abundance of food along a sturdy blade of grass. A praying mantis is in the perfect spot for a quick meal. The mantis, in turn, is lunch for a sticky-tongued lizard ... and so on. The last link in this chain is a panther. As happens to living things, the panther ages and dies, leaving nourishment for beetles and eventually, the soil. The richness of the soil encourages growth of plants that will keep the jungle a viable and productive system. Excellent word choice, perfectly placed text, and exceptional artwork will bring little ones back to this book repeatedly. The two fold out pages at the end show other life found in the jungle, as well as 'The Story of a Food Chain'. The brightly colored illustrations boast different perspectives and an invitation to return to find what might have been missed the first time around - in fact, an endnote delivers a challenge. "Look through the book again. See if you can spot which are the producers, consumers and decomposers." Wow! 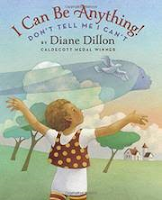 This is perfect nonfiction for little ones. They will soon be reading it on their own. "Blue jays use their crest to communicate their feelings. Crest up means upset or afraid, and crest down means relaxed. Blue jays are said to be able to recognize each other by the black bridle across their throat." I was talking with my family in British Columbia yesterday, and they are eagerly awaiting the arrival of spring birds. Their bird feeders are full, the hummingbird feeder is placed where the tiny visitors can be discreetly watched, and they are wanting to find pictures of the most common bird species for identification. This book would be a big help. 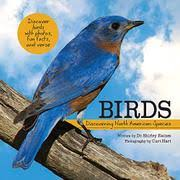 Written as a resource for STEAM (science, technology, engineering, art and mathematics) education and meant to be used in an early years classroom, it has what my granddaughters need to help them begin to learn about many of the birds that will soon be visiting their backyard and on nature walks in the nearby woods. There are 13 double page informative spreads. All are designed in the same way to provide a poem, and a short paragraph about the featured bird on one side, supported by a clear, colorful photograph, the name of the bird, and captions that relate engaging facts on the facing side. that can both hop and walk. Birds included are the American robin, blue jay, Carolina chickadee, ruby-throated hummingbird, downy woodpecker, Northern mockingbird, red-winged blackbird, Eastern bluebird, brown pelican, great horned owl, American crow, Canada goose, and Northern cardinal. The geese are back in Manitoba - a sure sign that spring will eventually arrive. So, get out your field guides, binoculars, and notebook to herald the arrival of each new bird you see in your yard and neighborhood. Three final pages offer 'Story Stretchers' meant to encourage further exploration in art, science, math and music. Another book of exceptional photographs from the natural world for the second post today. This one is a poem of thanks to the earth for all it provides. I have posted other books by Ms. Sayre and am equally impressed by this one. The design allows readers to move quietly from one image to the next, taking time to really see what is portrayed in each. We see 'slippery seaweed' placed in proximity to moss covered stones that sit near the ocean waves. The shapes and patterns of nature sit side by side, encouraging readers to stop and pay careful attention. The earth gives much. We must do our best to protect it so that it continues to do so. 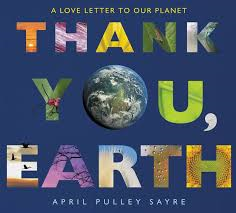 In an author's note and back matter, the poet suggests that we have a place in keeping our world healthy and viable. She suggests that all kids take a close look at the many things they can do to inform themselves and others about actions needing to be taken, and the learning to be done. A list of select resources and organizations that help to guide that learning is extremely useful. As well, there is a personal note about each of the photographs included. How will you thank our planet? I love this fusion of poetry and photography ... I think you will, too. a ride on Mom's back. This is the second book in a new series by this award winning photographer. 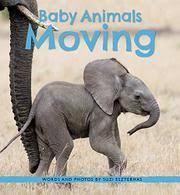 In the first she filled the pages with wonderful photographs of Baby Animals Playing. At our house, we fell in love with all of the captivating images of sweet babies enjoying their surroundings and their playmates. Today I am sharing an equally enjoyable book filled with photos taken around the world. We follow a number of babies as they make their way from place to place ... at times on their own, at other times surrounded by family members. It is easy to see how much Suzi Eszterhas loves the work she does by looking closely at the images she has captured. A tiny orangutan clings quietly to his mother as she swings from tree to tree. Warthogs babies stick together as they run quickly across the grassland to keep themselves safe from animals looking for a quick meal. Baby grizzlies, fearing the water, grab a piggyback ride on Mom as she cools off in a nearby river. "When I'm not snapping photos, I like talking to people about how they can help wild animals. I think it's important for kids to connect with animals and nature." She does a terrific joy of making that happen in the many books she has written for children. "Bat loved going to Mom's veterinary clinic. If it were up to him, he would go with her every time she had to work late instead of staying home with Janie. But Mom said that as much as she loved having Bat at work with her, all his questions sometimes kept the vet techs from doing their jobs. Bat tried not to ask too many questions. But there were so many interesting things ... "
Bixby Alexander Tam (aka Bat) is a boy worth knowing. I hope you like him as much as I do. If you do, you will be delighted to know that Bat and the Waiting Game hits bookshelves on Tuesday next week. Why will you like Bat? He is a third grader on the autism spectrum, and absolutely engrossed with an orphaned skunk kit his mom brings home from her vet clinic. The kit will need constant care until he can be sent to a refuge center prior to being returned to the wild. Bat feels he is up to the challenge and sets out to prove that he should be allowed to take care of Thor until he can be released, skipping the refuge center altogether. 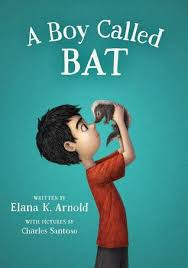 Elana K. Arnold gives readers such a clear picture of Bat, his family, the supportive staff at his school and his teacher Mr. Grayson, and his growing friendship with Israel, a boy at school. The word autism is never mentioned; yet she writes his story with knowledge and understanding of his experiences. By showing readers Bat's behaviors in third person voice, we see that much of what happens with him is the same as what happens for most of us. Bat's conversations with his mom and sister help us see how Bat deals with other daily events. When he visits his dad on the weekends, we learn more. By allowing readers to see into Bat's world and thoughts, these characters all gain importance and move the story along. It is both appealing and full of insight for readers. They will get to know Bat; what he thinks and how he sees his world. His family and friends adapt with humor and compassion, and allow us to understand how Bat's point of view may be different than most, but is worthy of appreciation none the less. It is a very sensitive look at an exceptional young man. I am eagerly anticipating moving on to the next book in this series. "He looked down at her sadly. I don't remember, he answered. I lost my words a long time ago. A frown clouded her face. How do you lose those words, Grandpa? she asked. They took them away, he answered. She thought for a moment. Where did they take them, she asked." What can you tell your granddaughter when she asks a question you should be able to answer, but cannot. Grandpa does not remember the word for grandfather in the language of his people - Cree. How does he tell her the story of his life without confusing her. She is only seven. When he says he can't remember, she doesn't understand how he could 'lose his words'. Her questions are so heartfelt. Her grandfather gently answers the questions she asks, hoping to help her understand. He explains that he and the other children were punished for using their own words ... until they could no longer remember them. His sadness is unmistakeable and his granddaughter does her best to soothe him. Following that conversation, she decides to find a way to make things better. At school the following day, she is helped to find something very special. "She stopped in front of him and took a deep breath. Tanisi, nimosom, she said. His eyes widened. She smiled brighter than the sun. I found your words, Grandpa, she said." From her book bag she produces a paperback copy of Introduction to Cree. What a wondrous gift it is! 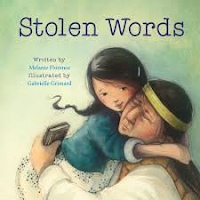 Ms. Florence's text is a comforting way to share with younger readers the losses felt by those who were forced to attend Residential Schools as children. Gabrielle Grimard's emotional renderings of the intergenerational relationship, and the sad circumstances of Nimosom's childhood add substance to the text. Using sepia tones for scenes from the past and more colorful ones for the present make for memorable, touching moments. It is a story of love and hope about a subject that has relevance for all, and fully impacts readers. It will be a long process for Grandpa to recover what has been lost, but it is an unforgettable beginning. 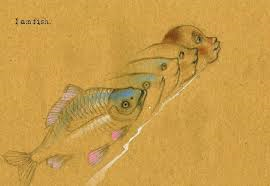 "Where can you see fish swimming in the streets? In the city of Miami Beach after a flood. A recent study shows that sea level rise has tripled in South Florida since 2006, and the number of floods has shot up. In fact, the sea is rising 10 times faster here than the global average. The South Florida area is made of limestone ... "
Keeping to the topic of water, I wanted to bring this book to your attention, too. Climate change is definitely on the minds of many people around the world, and working to find solutions to the dire straits we already find ourselves in is paramount. 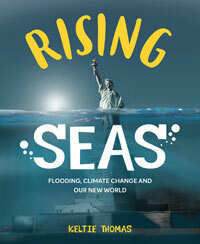 The issue of rising sea levels and the destruction it is causing is not something that was front of mind for me. A fairly lengthy introduction changed that. 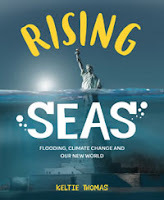 Sea levels have been climbing at a noticeable rate, and are projected to climb as much as 2.5 metres over the next 80 years. Alarming, isn't it? Many populous countries are in the danger zone - China, India, Bangladesh, Vietnam, Indonesia, Japan, Philippines, U.S.A., Egypt and Brazil. What will happen if rising waters leave people there homeless? Before moving forward to 15 major sites that are the most exposed to the dangers, Keltie Thomas also explains the why, the how, and the what about the future? for readers in graphs, maps, graphics and short bits of text. As each site is made center of attention, Ms. Thomas uses statistics, the present situation, and what can be done to make effective and lasting change. She begins with North America (Miami Beach, New Orleans, New York, Halifax and Lennox Island) and moves on to highlight ten other areas of the world in fascinating two-to-four page sections that include a spotlight full of information concerning each, photos, a map, a 'here and now' feature and what is being done right now to make significant change. A two page list of suggestions readers can do follows, as well as a considerable glossary, graphic descriptions of both the carbon and water cycles, 'more to explore', and an index; each is useful. After poring over this book's pages, I am much more informed that I was early this morning when I set myself the task of reading it so that I could write about it today. The design is appealing, the tone of the text conversational, and the statistics alarming. The visuals often astound. It leaves interested readers with much to consider. Be a clean, green power champ. Walk, cycle, skateboard, or blade. "A year later, over by the Atlantic Ocean, a niichii-kew had a bawaajgan, which she shared with Nokomis as soon as she woke up. Nokomis shared the bawaajgan with all the people she had met during her previous walks. Word spread across Turtle Island. Everyone began to prepare." Marches are proving to have an impact in our society by bringing awareness to a number of concerning and crucial world issues. I am sure that some of the people who plan and take part in such protests often feel powerless. But, they are making their thoughts known. 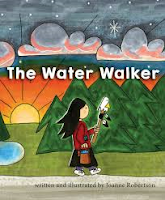 Today is World Water Day, and it seems an appropriate time to offer up this fascinating story of the Water Walkers, led by Nokomis. Nokomis awakens each morning to sing a song of respect to 'every living thing on Earth.' Distressed when warned by an elder that water is precious, will become very expensive, and must be protected, Nokomis takes up the cause. making it unfit for life." A dream sets a plan in motion. Gathering friends, Nokomis (Josephine Mandamin) leads the Mother Earth Water Walkers around all of the Great Lakes and the St. Lawrence River. Every spring for seven years, the Walkers bring attention to the plight of water in North America. It is quite the remarkable feat, and a powerful protest. "During her 2015 walk alone, she put almost 4,500, 000 footsteps on her sneakers!" That is dedication, and worthy of much respect. This book is a lovely tribute to her dedication to a cause of great importance. A list of Ojibwe words and their pronunciation is found following the text, as well an author's note with further information about Nokomis, and her address. She would love to hear about what children are doing to protect our water. "The sun isn't even up yet, but Fox is ready! He has a long day's walk ahead of him. With his trusty compass and map in hand, there's no danger that he'll get lost. The forest is quiet and peaceful first thing in the morning. Only a few birds are awake ... "
Fox is a collector, always on the lookout for a new plant. He reads old botany books and field guides while at leisure, and with pleasure. A missing bit of artwork piques his interest and leads to a new quest. "The golden glow is a plant form the Wellhidden family. It is very rare and only grows high in the mountains. No specimen has ever been described." A challenge? Yes, it is! Gathering up everything he will need while he searches, Fox is off to the mountains in the very early morning. He keeps a careful watch as he goes, always on the lookout for something unfamiliar. Sadly, every plant is known to him. Along the way, he meets his friends Bear and Wolf. Neither can help with his search, but both have advice to give. Bear suggests that Marmot might know; Wolf says he can help find the elusive Marmot. Wolf leads the way. As they go, Fox names every flower they see. Finally, Wolf whistles and Marmot appears. Marmot suggests it will take a hike to the top of the mountain to find the elusive plant. Fox is up to the challenge. Mountain Goat does his best to deter Fox from the harsh journey. On he goes. Upon arrival at the summit, Fox sees nothing of interest. It isn't until he settles in to watch the sunset that his paw brushes against something very special. Amazed, Fox does exactly what you would expect a skilled botanist to do! In a mixture of digital painting and hand-painted textures, Mr. Flouw designs both single and double page spreads that are warm and rich in color, offering readers many details sure to absorb their interest and move them from one page to the next. 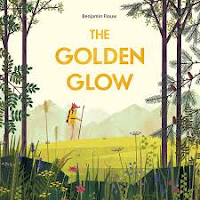 The 'golden glow' is as dazzling as one might expect of a member of the Wellhidden family. Little ones are sure to be impressed. I really appreciated many of the spreads and the way in which he depicted the day as it passed from early dawn to late evening. Marvelous! "Every summer, at our family's lake house, my big brother and I swim to the rock. Every year, he jumps off, as I watch and cheer, too afraid to even try. This morning, while my brother and I were walking to the water, he told me it was time. I was big enough. "It's your turn now." Not now, I thought." As we celebrate the arrival of spring, I have two books that I would like to tell you about today. Both speak to the power of nature to impact our days, and our lives. In the first, two brothers replay a yearly summer event ... the swim to the rock. Each year the older one climbs up and jumps off. The younger cheers him on while he watches from the water below. This year is different. This year, they will both jump. Off they go. Sure enough, the older one does what he has done every year. easy. He is cat. He is bird. Should he? Could he? Not wanting to show how fearful he truly is, the younger brother climbs a clear path to the top of the rock. Standing there, he is not so sure. "Breath. Heart. Breath, breath, heart. 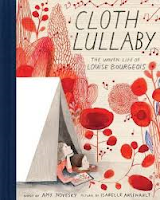 Told with joy and love, and illustrated with wonder, this is a book that is sure to become a favorite read for many. It is a story that has courage, love and family at its heart. One brother's belief in the other gives the confidence needed to overcome fear and take that plunge. "You've never heard of him? guest on The Milton Berle Show. they used to call him the Mayor ... "
It is 1965 when Norman enters a shopping mall contest and wins! The prize is one thousand dollars, and Norman's parents agree that the money is his to do with as he pleases. No one else will have a say in how he chooses to spend it. True to their word, they let him make the decision to take the whole family (his parents, his two older brothers, and himself) to Miami Beach at Christmas time. Norman wants to see the ocean, and to enjoy the sunshine! Their home for the week is the Royal Palm Hotel, and it is pretty special - for a few reasons. Opulent and comfortable, boasting proximity to ocean waves, terrific food, and a slew of other guests. Among them is a family from New Jersey - the Horvaths. The irony is that the Horvath family has three girls, all matching the ages of the Fishbein boys. Rivals from the beginning, they are soon immersed in attempts to outdo the others. Norman and Amy, the youngest of the siblings, do not want any part of the constant bickering and strike up a friendship which they keep secret. Entertainment in the dining room is provided by Mort Ziff, an aging comedian. Norman and Amy have a mutual admiration for the old man, enjoying his dry humor. When his spot in the dining room is usurped by a Beatles wannabe band, the two take action. They arrange with the outlandish owner of the hotel to have Mort perform in the coffee shop, a little-used small restaurant in the hotel. Wanting it to be a success so that Mort can continue working and living at the Royal Balm, they enlist the help of their siblings to advertise his gig. Good for them! This is a funny, fast read. I love the old-timey family feel of it. It is cleverly written, very entertaining, and tender. Norman's first person voice gives the story heart. 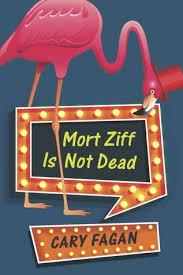 Mort Ziff is stand-out and makes for many enduring moments. Read it aloud to your family or share it in your classroom. You will not be sorry. Here's proof that Mort is not dead! "So tell me, how's the food? I ate here about ten years ago. But I'm better now, thank you. I ran into a man I know. He said, 'You know, when my wife and I had our baby he was very cute. But as he gets older he gets a little uglier every day.' I said, 'Well, did you expect him to look like you all at once?'" "Lola had always wanted to remember the Island, but no matter how hard she tried she never could. It was like a familiar word just at the tip of her tongue, but instead of a word this was an entire world! Lola closed her eyes and tried to recall anything about the Island but nothing came up. She kept trying all through the school day ... "
Who wouldn't want to meet this little girl? She exudes happiness and warmth. The title page places her story in the neighborhood of Washington Heights in New York City. The first two lines tell us everything we need to know about it. "Every kid in Lola's school was from somewhere else. Hers was the school of faraway places." In Leo Espinosa's opening double page spread, we can see just how welcoming a place it is, as parents and children make their way to the school's open front door. Ms. Obi has an assignment for her students; one that they can work on at school and at home - it is due tomorrow. The classroom erupts with excitement. Everyone is talking about the place they were born and the memories they will share it their assigned drawings. Everyone that is but Lola. She has no memory bank to draw from; she left the Dominican Republic as a baby, too young to remember anything about it. Through careful questioning and support from her teacher, Lola is able to make a plan. 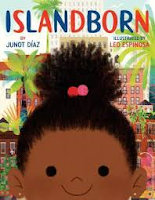 Because she cannot remember a thing about her island home, she looks to her community to help her understand what is so special about it. Each person she talks with has a very specific story to share - the music, the colors, the food, the people. From her building superintendent she hears the other side of the story. He tells her of a time of great fear and endless sadness when a 'monster' (dictator Rafael Trujillo) held power, and how difficult it was for so many to resist his overpowering hold on their homeland. 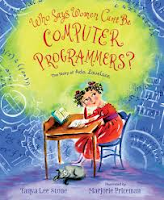 Their stories are all Lola needs to fire her imagination and provide incentive to create a drawing that makes her proud, and impresses her fellow students. La Isla fill her head with images that make their way onto to her drawing paper. As her family, friends, and neighbors tell their stories, her pride in her birth country swells until she is ready to share a very important discovery. Leo Espinosa has filled the book's many pages with energetic, detailed mixed-media illustrations that offer a sense of the pride felt for their island home and the beauty found there. Willy. How can I get rid of it? the light and closed the curtains. window. "Fantastic - it's gone!" he shouted." I have always been a fan of Anthony Browne and his wonderful books. I eagerly await anything new, and am happy to share this one today. In clear and candid text, Mr. Browne speaks to a wide audience about worry and fears. 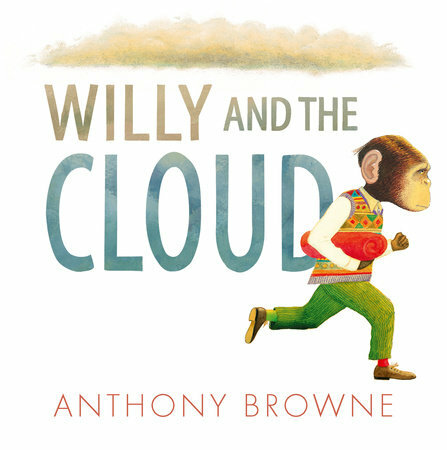 The cloud that dogs Willy represents so much of what children are dealing with in today's world. It is an emotional time and place. Readers will see themselves in Willy's worry. Although his day begins comfortably, he soon finds himself consumed with the cloud that suddenly appears in the sky, first as a tiny one and then exponentially bigger. He does his best to outrun it, and thinks that he has. Not so. At the park, on the way home, outside his window, it is always there. He tries to tell the police. They laugh. He does his best to avoid its presence. Fussing about it changes nothing. Exasperated, he charges outside, yells loudly and tells it what he thinks of it. FINALLY - it does what clouds are meant to do. Following a soothing and refreshing rain, Willy heads out to enjoy the rest of his day. 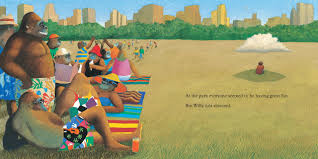 The illustrations are signature Anthony Browne. 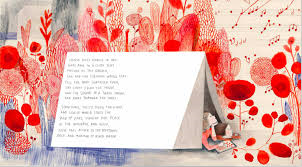 Created in mixed media, and filled with color reflecting the mood in each spread, they help young children understand just how debilitating fears can be, and how facing those fears makes a difference. I love the spread that shows Willy dancing around a light post in the rain! Trigger any memories for you? my mother in the attic. performer, and even the night sky. Dress up. Pretend. Make believe. What a beautiful tribute to Elsa Schiaparelli this is! Following their first book together, Julia, Child (2014), this talented team now consider the life of the highly influential and original fashion designer who took the world by storm with her imagination and love of color - especially 'shocking pink'. Born at the very end of the 19th century to parents who favored her older sister, it wasn't long until Elsa was ignoring the doom and gloom of the family home and basking in the outdoor colors of Rome. Her quiet nature, her love of color and her inquisitive mind led her to ask questions of herself, even at a young age. as confident as a daisy? A seed seller pins a flower to my dress. It is strange but wonderful. He has given me AN IDEA." Few children would ever consider such an idea. "Schiap' immediately went home to plant flower seeds in her ears, mouth and nose! It was not a good plan; but, it led to the discovery of her own 'wild imagination'. 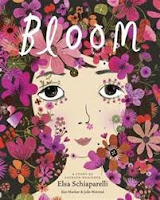 A visit to Milan and her uncle Giovanni, also a dreamer, gives Elsa the courage to be herself and use her artist's eye to see her world through a different lens. What is missing in her pursuit of fame in fashion is money. Dressmaking brings her much joy, and eventually supportive friendships with other artists who are looking for success and fame. At 37, she opens her own shop and the rest is history, told beautifully here. "I say NO to the expected. Just as Kyo Maclear impresses her audience with a first person voice and the angst that pushes 'Schiap' to find a meaningful life doing what makes her happy and successful, Julie Morstad dazzles with her stunning detailed illustrations, created using liquid watercolor, gouache, and pencil crayons. 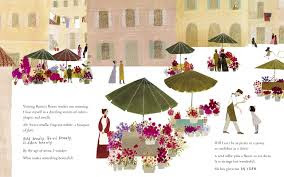 There are so many spreads that will startle and delight readers, while giving a real sense of this admired designer, her life, her loves, and her superb talent. Back matter includes notes from both author and illustrator, a list of endnotes, and sources and further reading for those intrigued enough to learn about a true fashion icon. Just exactly what is Petra? Little ones will take great pleasure in trying to guess her identity. By watching the artwork, and hearing what she says about herself, the guesses might be even be wide-ranging. Cold, wet weather doesn't bother her, so long as she has her scarf. It appears she lived at the time of the dinosaurs. She even seems to have a small village perched atop her head. What is she? A series of wordless pages offers a different perspective. Will her confidence be compromised? No! She just rewrites her own story, again and then again. 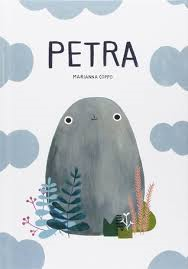 Never losing her certainty that she is something very special, Petra teaches a lesson that should sit well with each one of us. We are what we are, and we should be happy with what change brings. The story is carefully constructed in language sure to appeal to our youngest readers. Petra embodies adaptation, always with grace and charm. 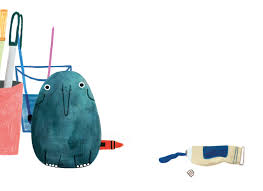 Ms. Coppo uses tempera, pastels and digital collage to create the emotional twists and turns in her story, always with slight changes in expression and eye movement. White space ensures that little ones understand the changes in size that occur, almost by magic. Joyful and uplifting, this is a book that needs to be read out loud ... loud and proud. I can't wait to share it! "The US government thought Katherine and all people of Japanese heritage living on the West Coast could be dangerous. They looked like an enemy of the United States in a complicated war halfway around the world, so the government ordered that they be imprisoned. Miss Breed gave Katherine a stamped, addressed penny postcard ... "
We have all heard stories of the Japanese internment following the bombing of Pearl Harbor in 1941. In Canada and the United States, governments made the hasty decision that all people of Japanese descent were a potential enemy to their country, and they removed them from their homes and communities to isolated locations where they lived out the duration of the war. It is hard for any of us to imagine what it was like for those families and their children. Clara Breed loved and empowered all the children who visited the San Diego public library where she was librarian, offering guidance for book choice and encouraging their passion for reading. So, when some of the children who were regular visitors were forced to move away, she wrote to and received letters from many of them. Those letters made a connection to the lives they led before the war made them prisoners. Ms. Breed sent books, postcards and art supplies, wrote letters to the children and to those who had put them in those camps. She sought justice from an unjust system. The letters are housed at the Japanese American National Museum and speak to the power of books to make life better. Many quotes from the children's correspondence are included on the pages of this uplifting book. opened the package for inspection. Thank you, Miss Breed, Thank you! and one large laundry room. Archival photographs with informative captions are featured on front and back endpapers. 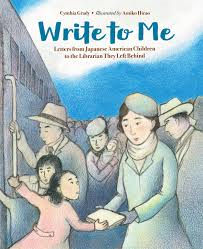 Colored pencils are used to create the soft, sepia-toned artwork that shows the conditions in the camps, the joy the children felt when books and postcards arrived, and the uncertainty that awaited them at the end of the war. An author's note, a timeline of important dates in Ms. Breed's life, a short history of the people who came from Japan to live in the USA, source notes, a bibliography, and books for further reading extend the learning. Teachers and parents wanting to know more about Miss Breed should check at the library for Dear Miss Breed by Joanne Oppenheim (Scholastic, 2006). It is also worth your attention. 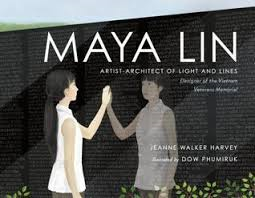 "One day when Maya looked at the patterns of light and lines on the ceiling of her college library, she imagined she would become an architect who created buildings with art, science, and math." It constantly amazes me to see the number of quite remarkable picture book biographies being published today. As I was looking through the ones I had piled up to share while honoring women this past week, I was quite surprised to see how that stack had grown. We have good reason to celebrate those who have accomplished exceptional work in their field, and I want to tell you a little bit about one more of them. It recognizes the Chinese-American artist who created the design for the Vietnam Veteran's Memorial. As a child, Maya Lin loved to play in the woods near her home, and often spent hours in silence, watching the wild animals who lived there. She even held out a hope to tame them. At home, she and her brother enjoyed chess, art and doing what made her happy. Her parents, artists themselves, encouraged Maya's ability to learn. In her last year at college, she decided to put that learning and artistic ability to work by entering a contest to design a memorial honoring those who had died in the Vietnam War. She visited the site where the memorial would stand. Everything she felt about the soldiers, the space and the reason for the contest led her to a design that was accepted from a strong group of 1,421 entries. What an accomplishment and what a furor it caused. Despite many objections, Maya remained true to her vision. Work began. for the name of the father of a friend. just as she knew others would." Since that day, many thousands of people have visited - seeing, touching, remembering those who gave their lives. The memorial was only the beginning for Maya. She has gone on to work on many different projects, all with the same wish for those who visit. but all share Maya's vision. a part of the art. Look. Touch. Read. Walk around. Sit by. Think about." This book is a quiet celebration of the artist-architect's work, and gives readers a real sense of what she has accomplished, including being inducted into the National Women's Hall of Fame, and being awarded the National Medal of Arts. Detailed artwork offers varying perspectives, clean lines, and the wonder that Maya Lin saw around her. An author's note follows the clear and impressive text. What a glorious, and heartbreaking, introduction to Mary Wollstonecraft Shelley this is! 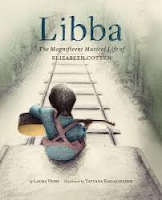 It is a departure for Lita Judge from her much admired picture books. 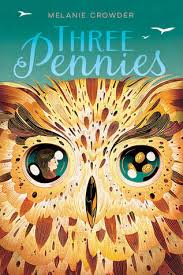 For five years Ms. Judge has researched and crafted a brilliant novel in verse about a teenage girl living in 19th century England. What was it in her life that led her to write the fascinating story of Frankenstein, first of its kind and a book that remains popular even today? Written in first person, readers follow the events and experiences that fueled Mary's imagination and gave her inspiration to write. Working diligently through considerable sources, Ms. Judge follows Mary from 1812 through to the publication of her first book in 1817, at a time when she could not even be named author because of gender bias. It is a harrowing journey. Mary, at 16, is ousted from the family home for her relationship with Percy Bysshe Shelley. She is a teenager, deeply in love at first sight, and pregnant with his child. Their relationship does not sit well with the mores of society, and the two are plagued by poverty, grief, and misfortune. The many struggles, untimely deaths, Shelley's dalliances with other women, his cruelty and mental illness are woven though Mary's story and help readers understand how such a young woman could write her most celebrated work. Knowing more about the times she was living in helps to explain why she remained in that relationship ... she had few options, and she loved him. Written in nine sections, paralleling the nine months it took to 'give birth' to Frankenstein, the book is illustrated using a combination of pencil, watercolor, ink and digital techniques. The realistic black-and-white images evoke all of the emotions felt as Mary lived her life - fear, sadness, love, passion, anger, agonizing grief. Realistic and innovative, it will attract readers with its exceptional design, and distinct format. The introduction, the prologue and epilogue (written in Frankenstein's voice), further notes about Mary and her times, an author's note, concise notes on each of the characters and a list of the books they were reading at the time, source notes and a bibliography speak to the dedication Ms. Judge had for her research and this remarkable story. 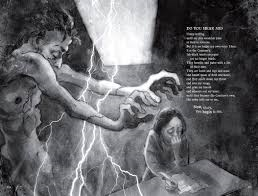 "By using free verse and full-bleed art, this is not just a novel in verse or a graphic novel. It is part biography, part visual fantasy, and part feminist allegory. I also wanted readers to emotionally connect with this remarkable young woman. I thought poems paired with art could accomplish this best." You don't look all white. You don't really look it. Were you raised on a reserve?" "No, I was raised in the city. Oh, well, I guess you're not a real one then, right? No, I'm getting my master's degree. right? Wish I could go to school for free. Anyways, I guess you're one of the good ones, right? Well, you're not a drunk or anything, good for you. Okay, turn over, let me get to your back." Read that again, and then again. 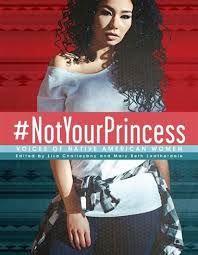 This amazing book offers a look at the Indigenous experience from the point of view of women, young and older. It is a diverse collection; as diverse as the women whose work is included. Artwork, poetry, photography, news articles, op-eds, and memoir all find their way onto its pages, informing and enlightening readers. Fifty-eight women have made contributions, and their vocations are as varied as can be: athletes, filmmakers, politicians, students, elders, artists, environmentalists, actors, photographers, physicians, and businesswomen. Their accomplishments, the obstacles they have faced, their life experiences and their hopes for the future are presented in four sections, beginning with The Ties That Bind Us. Their bonds with family memories and lessons are presented in various ways. In the second section, It Could Have Been Me, the artists explore their many fears about becoming one of the missing and/or murdered Indigenous women. They also show concern for the actions and mindset that have led them to being victims. around. But I don't want to be afraid. I want to have good energy." The third section is titled I Am Not Your Princess. It explores media that does not value the culture of Indigenous people, by stereotyping and negative representation. There is sadness, anger, and bewilderment. door and down the paved sidewalk to my next class. And finally, Pathfinders is a celebration of strong women who lead with distinction, honor, and hard work. Their stories are emotional, inspiring and worthy of attention. It is a book written to speak of what has been, what is now, and where the future might lead. The design is dramatic, authentic, and full of observation and wisdom. It provokes thought and causes readers to reflect and consider alternate ways of looking at diversity, history and identity. You should read it, and then share it! Look at yourself in the mirror . 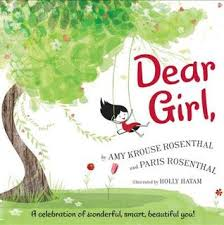 It's been a year since Amy Krouse Rosenthal's untimely death. Her family, friends, and people around the world have been keeping strong her memory in acts of kindness that are inspirational and infinite. Her last book was a collaboration written with her daughter, Paris. Together, they have penned a string of quick letters, offering advice and encouragement to go forward with pride and strength. It is a lovely reminder to those who read it that a book can lift you up, at any time and for any reason. Thoughtful, protective, aware, kind, tenacious; readers will find themselves (at one time or another) in its pages, and hopefully open to taking the important advice given. It is what parents want for each of their children. It's sad to think that we need to remind those children on a daily basis of their strengths, their unique abilities, their place in the world. This book helps them love who they are. "Too bad you're not smart,"
Poor Sophie! She wears her heart on her sleeve, and her emotions come quickly to prominence. I have been sharing her books since 1999 when I read When Sophie Gets Angry - Really, Really Angry for the first time. And then again with When Sophie's Feelings Are Really, Really Hurt (2015). So, I was excited to see this new book about solving problems and not feeling very smart. Each and every one of the three books speak to young children about the authenticity of their feelings and encourages them to persevere. Sophie is really discouraged about her inability to solve puzzles. She knows she can't do them, and that math is not her strong suit. Her sister just told her so. Her teacher encourages her students who are finding a given assignment difficult. Sophie and her partners find their own unique ways to solve the puzzle presented! On her way home from school, Sophie delights in her newfound skill, and uses that spirit to help her father with a difficult project. Once she thinks she can do it, she is on a roll. 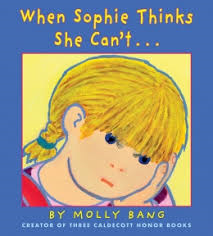 I love Molly Bang's signature art for Sophie's stories. 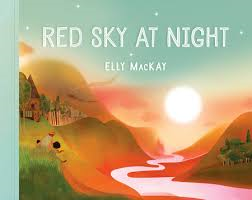 Bright, busy and full of detail, young readers will find much that is familiar to them. The expressions are well-known to those who have seen Sophie's struggles and her determination. so I won't hear you." "I'll be a veterinarian and help ... "
"What if you fall? said a little voice." "What if you can't get home? said the voice. "What if you get homesick? You're too little, said the voice." Zoe is tenacious, and imaginative. She is not too little. She will not fall. Always, that little voice to make her stop and think ... but, she won't give up her dream of being anything she wants to be. That voice won't stop her. Zoe gives young readers pause to consider what they want for their future. In the end, she knows exactly what she must do. about all the things I can be. Don't tell me I can't!" In this first book to be both written and illustrated by Diane Dillon, she brings Zoe into scenes filled with detail and placed on thick white framed borders. Each little scenario shows a confident, thoughtful little girl making her way in a world of imagination and delight. in the bloodied dirt ... "
Harriet Tubman is a familiar name to most of us. 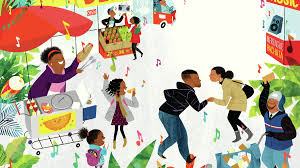 What I love about this picture book biography is that Lesa Cline-Ransome begins at the end of her life, when she is on board a train. From there she moves back in time to chronicle all of the amazing roles Harriet played in her long life. She was a union spy, an Underground Railroad conductor (perhaps her most noted work), a nurse, a suffragist, a guide for her parents to safety in Canada, and a slave herself. She is known by many names - Araminta, Minty, Moses, Aunt Harriet, General Tubman and finally, Harriet. Harriet was not allowed to ride a train in her early life, so it is fitting that she now can do so, although it remains a segregated means of travel for her. It is impressive that the train ride begins and ends the book, with a slight change in the text on the final page. Wonderful! 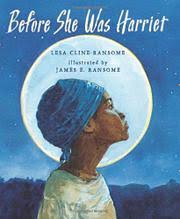 James Ransome uses watercolors to show readers what a truly special woman Harriet Tubman was. Through his detailed double page spreads the audience is witness to her compassion, her resolve, and resourcefulness, and her belief in better days. Once a young girl, strong and determined, she remains near the end of her life as regal and iconic as she ever was.